While most are on board with the investigation coming to a conclusion, they are split on what will come of the inquiry. 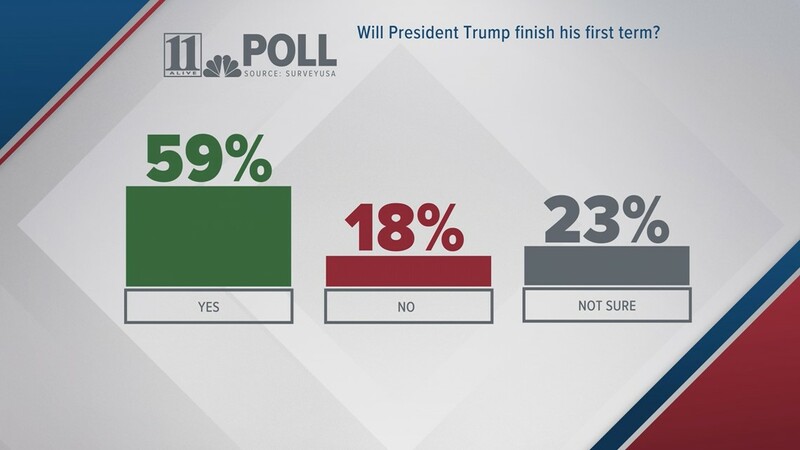 ATLANTA — It's been one year since Special Counsel Robert Mueller opened an investigation into possible collusion between the Trump campaign and Russia during the 2016 presidential election, and majority of Georgians believe he should be allowed to complete his investigation. 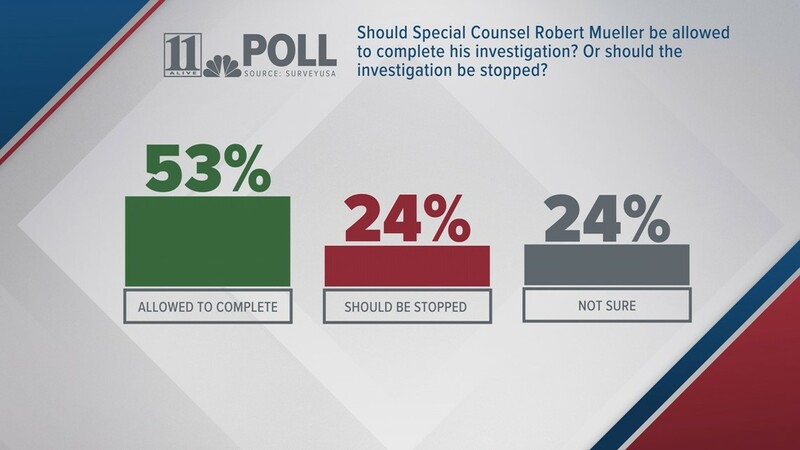 While most are on board with the investigation coming to a conclusion, 40 percent of those surveyed believe the results of the investigation will lead to nothing. More than 10 percent of people believe there may be criminal charges waiting at the end of the investigation while 7 percent of those surveyed believe President Trump could be impeached as a result of the findings. 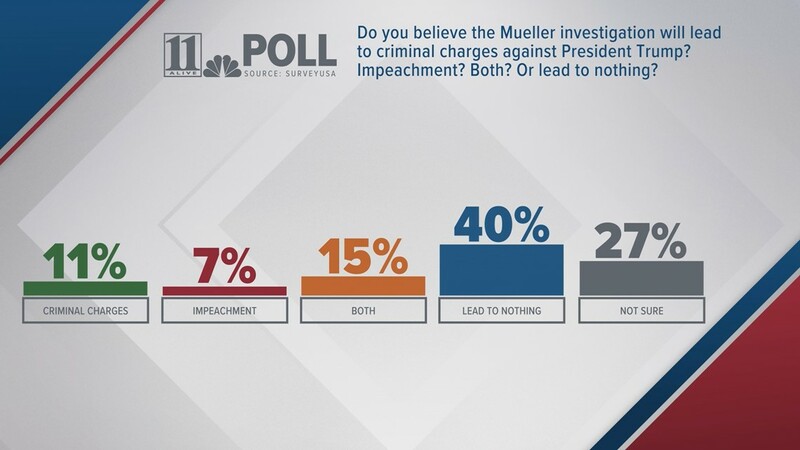 Fifteen percent believe there may be both criminal charges and impeachment. Meanwhile, nearly 30 percent of survey respondents were unsure of the outcome of the investigation will be. Regardless of the outcome of the special investigation, a solid majority of people believe President Trump will finish his first term in office – 59 percent to 18 percent, with nearly a quarter of respondents answering they were not sure. When asked their opinion of President Trump, more people said they had a favorable opinion than an unfavorable one, 42 percent to 36 percent. Fifteen percent of people had a neutral opinion of him, with 7 percent having no opinion of him. 1. 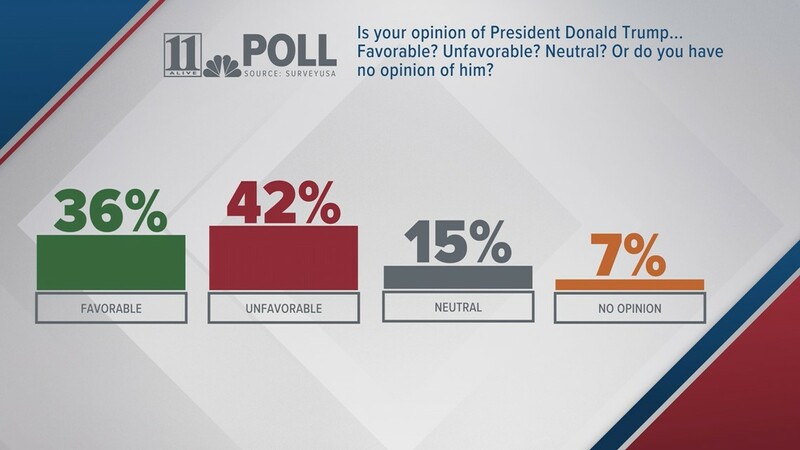 Is your opinion of President Donald Trump ... favorable? Unfavorable? Neutral? Or do you have no opinion of him? 2. Should Special Counsel Robert Mueller be allowed to complete his investigation? Or should the investigation be stopped? 3. Do you believe the Mueller investigation will lead to criminal charges against President Trump? Impeachment? Both? Or lead to nothing? 4. Will President Trump finish his first term? Will there be a Republican run-off in Georgia governor's race?